Envision the day Angelo Mozilo is arrested, and frog marched out of the raided Countrywide headquarters. Envision the day Angelo Mozilo is sentenced to spend the rest of his life in prison, after having his assets seized. Is the world any better after this? Millions will have still lost their homes. Millions will have lost their jobs. Families will still have been ruined. And one Orange Man wearing an orange jumpsuit will sit in a lonely jail cell. But let's go ahead and get on with it. ARREST ANGELO MOZILO. THE HOUSING CRASH NEEDS ITS BERNIE EBBERS. WE NEED OUR KEN LAY. 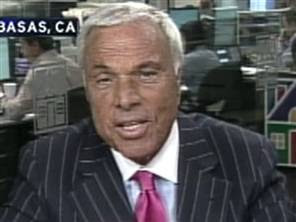 AND THE INSIDER TRADING KING OF MORTGAGE FRAUD ANGELO MOZILO IS IT. Keith, ain't gonna happen this year. Sorry. Yep, people here are riled up about the housing market, but unless you live somewhere like Cali, Nevada, Arizona or South Florida and are trying to sell a house, most Americans really aren't that worked up about it yet. They still have their jobs, can make their payments (mostly), and still have their toys. It's depressing that their house value has gone down, maybe their job is a little shaky, but overall they are feeling ok. Besides, they're getting that check in May, right? All's well for them for now. Wait a year for the economy to get worse, and then maybe he'll go to the slammer if he hasn't bugged out for the Bahamas or Switzerland by then. If hell really does exist, then this man needs to rot in his worst possible hell! Not going to happen Keith! He's too well connected, with too many well connected friends to prop him up, or go down with him. NOBODY in power wants this guy to start blabbing on the witness stand as part of a plea bargain. I am waiting for the US equivilant of that scapegoat non-entity in France to pop up shortly in America, so ALL the big banks can blame their troubles on him/her. And even if the orange one did get nabbed, tried, and sentenced, so what. Ken Lay has shown the way. Mozillo has a quick fake death, and its off to retirement at his private estate in Paraguay, right next Ken and W! Countrywide is still writing bad mortgage loans as we speak. Backed by the full authority of B of A. No change...crookery is still king. They don't arrest those guys Kieth.Because-"THEY" are "Them"
So the best thing to do is enlighten Joe Six as to the pitfalls of doing business with Banks,Government,etc. Martha is one of Them,acting all "apple pie",and common. The US isn't a country,it's a game. bush's final act of betrayal will be pardoning Mozilo. Kinda like Clinton pardoning Marc Rich and hundreds of other corrupt businessmen, drugs dealers and terrorists. 1) He will keep all his money. 2) He will be appointed ambassador to something or other. 3) He will give money to corrupt politicos. Was just sorting through resumes for a $14/hr front office person for my wife's office. There were a couple of resumes from mortgage brokers etc. Told the wife, "we don't hire any ex-mortgage brokers". All they know how to do is lie and BS. Don't trust them alone. Must be tough to go from big bucks to being denied $14/hr jobs. Not going to happen - so just live with it Keith.... Just cuz' you aint got connections.... don't bring down others. Probably McCain or Rommey will nominate Mozillo as Treasury Secretary, if elected, just like the Bush/Cheney did with Paulson, who's the original creator of the CDO mess. Told the wife, "we don't hire any ex-mortgage brokers". Same here. My wife brought a pile of resumes home another day, full of former realtwhores and mortgage crooks applicants. Those went right into the trash basket. None of them had a college degree either. I don't even want friendship with those kind of people. Life is too short. Somebody tell me what it was that this guy did. I'm new to all this mortgage stuff, love the blog and getting educated pretty quickly, but don't really understand why this guy is singled out for contempt. I'm not saying he isn't worthy, lol, just want to know, in layman's terms, what it is that he did. I am tired of Mozilo (as I'm tired of Casey Serin). If BofA buys Countrywide, he's out; if they don't buy, Countrywide probably goes bancrupt and he's out - anyway, he's out. While I would like to see some ambitious district attorney to put Mozilo in front of a grand jury, I think we have to wait for that until more people feel the economic pain and scream for punishment of the guilty. Do they have solariums in jail? I hope he eventually gets arrested, but not right away. Designating a scapegoat will allow the markets and the politicians to say the problem has been "solved" too easily, letting a lot of lesser players off the hook. A lot of individual brokers and realtors need to be held accountable for their actions over the long term. Hopefully we don't end up with evil lawyers replacing evil bankers in the economic food chain. I agree that there is a danger of Mozilo being named to a government position after the elections if reckoning is delayed too long. Politicians admire teflon coated cronies. Arrest Mozilo for what? Did he force anyone to sign on the dotted line? Did he force anyone to accept an ARM mortgage? I don't think so. I want to see angry mobs with torches, hoes, pitchforks and rakes chasing a naked Mozillo down the street in outrage. Then perhaps my wrath will be quelled. Please stop calling him Angelo, it's TANGELO!! >>>Arrest Mozilo for what? Did he force anyone to sign on the dotted line? Did he force anyone to accept an ARM mortgage? I don't think so. So I suppose you feel the same way about DRUG dealers???? Mozilo's the number one con man in America. Have no doubt, this man is a Hollywood criminal of the likes that even a Keyser Soze can't compete against. His exit has been orchestrated from the beginning. His plan was to pump, dump, and manipulate BoA or the Fed into a bailout with the "handshake deal" that no one talks or he goes public with a lot of dirty laundry on the banana republic maneuvers between Freddie/Fannie and the banking players. I repeat, this is the number one con man; roll over Ebbers and Lay, you've met your daddy!